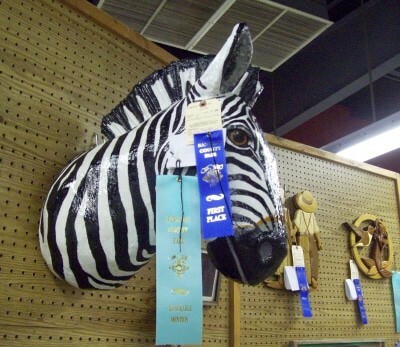 I recently received word that one of our readers, Lisa Crowther, won first place AND honorable mention for her fabulous paper mache zebra sculpture, which she named “Zowie.” Congratulations, Lisa! Her ribbons are shown below. Lisa worked hard on this sculpture, and she has every right to be proud of it. On a totally different note, I’m happy to say that Jessie’s recent experiment with the online art sales website paid off, but not quite as she expected. A visitor saw her work on the auction site, contacted her, and bought an original oil painting directly from Jessie’s own online gallery. So – more congratulations are in order. If anyone else has found a good way to sell artwork, please let us know — and get a nice free link, while you’re at it. 😉 After all, we artists should support each other, shouldn’t we? And one final note – did you see the news article about a totally new and different way to use paper mache? Inmates dug through the brick walls of a prison and hid their work with paper mache bricks. Until, of course, they were caught. I wonder if they learned how to make paper mache in a prison craft class? This is a great example. I have for this site to be so helpful and I look forward to Jonni’s books! This is my first attempt at a large scaled piece. I now know where I can make some improvements and look forward to my next project! Hi Diana. Did you try to upload a photo? If so, please try again. The image might need to be a bit smaller to work. It worked – and your zebra is lovely. How big is it? I started with a thin plywood frame with 1×4 spacers for the ligatures. (I think I watched your video on the making of the baby elephant 10 times!) I didn’t get a chance to use any paper-clay on the Zebra. But, I had purchased what I needed just incase. My daughter loves Zebras, and is having a jungle/safari birthday, so I figured I’d give this a shot! 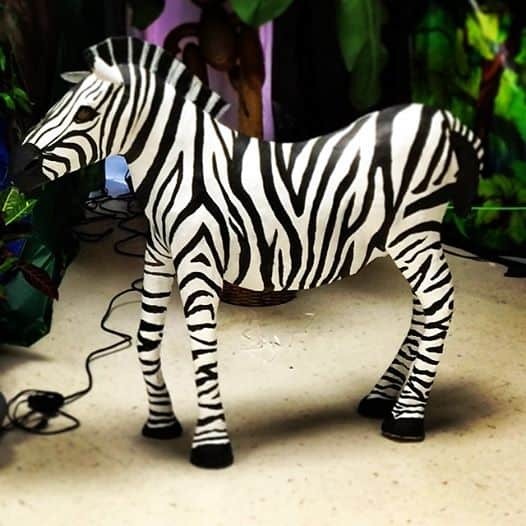 We already used the Zebra, now named “Zenny”, as part of the décor for a Father/Daughter Dance, and it went over really well. Thank you so much for all these wonderful tips! Hey Jonni – I really love these animal busts; they sell a paper mÃ¢chÃ© rhino at Anthropologie (http://www.anthropologie.com/anthro/product/home-wall/970122.jsp) that I want to recreate and I found my way to your page by googling paper mÃ¢chÃ© techniques. I noticed you have some on the wall behind you in your cat building tutorial. Do you have any tutorials for the busts? Or any advice? Would I just go about building it in the same manner as the cat? Thanks!! The animals on the wall behind me were made using a different method and materials. You can see how they were made in the Pantalone and Wolf mask videos. The wolf mask actually combined both the fast-setting paper mache over modeling clay, which I developed for my mask book, and then I added texture and some small details using the paper mache clay, which I used to make the animals in my sculpture book. The busts would work really well with this combination – you’d get the right shape easily with the clay, have a lightweight but strong shell from the paper mache, and then have all the fine details you want by using the paper mache clay. You can get almost all the information you need for your bust from those two video series I mentioned. Hi Jonni – Oh now that’s funny – paper bricks, next time I’m in prison – I know what to do, and my accomplice will be you! I just hope the jailhouse is in Mayberry. Anyone who needs clarification wasn’t watching the telly in the 70’s, or was it the 60’s? And what a Wonderful zebra!! Hi! I don’t really have any experience in paper mache but I really want to do a horse head, neck, and legs for a halloween display. So, I have a question, would you use a wire frame first and then cover it with paper mache or use carboard instead? That’s a hard question, Kita. If you’re intending to wear the horse head, I would be concerned about using wire inside. If you accidentally fall or get pushed against a wall, the wire might poke through and hurt you. For that kind of thing I’d think about using a cardboard frame, or perhaps styrofoam. However, many people use wire frames for their paper mache. I hope Lisa is still watching this post – she could give you better advice. 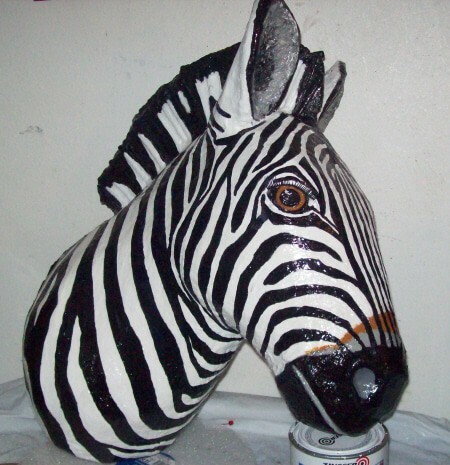 This is Lisa,the maker of the paper mache zebra head. I read your comment and What i usually do to make a horse head is I first draw out an outline of the head and neck on cardboard. Then I take thin strips of cardboard pieces and hot glue them on the outer sides of the outline after i cut it out. then I place newspaper balls all over both sides of the cardboard piece. I keep adding newspapers until i have enough structure to paper over. Sometimes I keep adding cardboard strips in certain areas until i am satisfied. Muzzle and cheeks can be built up by bending several thin cardboard strips and hot glue the ends to the area you desire.. I recommend placing them in a horizontal “U” shape,downwards onto the structure,like a mound of dirt would look. If you plan to wear the item, that is tricky. I do not have any answers for costumes. Thanks for the info. I have tried the paper clay recipe twice and I am having trouble getting it smooth, the problem being the toilet paper. I am using Angel soft and I have wet it then rung out the water to measure out 1 1/4 cups of damp paper pulp. I break down the pulp into smaller pieces and then incorporate the rest of the ingredients. The clay is smooth but has lumpy pieces of pulp throughout. When I apply it to my form it’s lumpy and impossible to get a smooth even layer. The only thing I have found that smooths out the texture is to go over the clay with a wet finger to smooth it out. What am I doing wrong? It’s possible that you’re wringing out too much water, which could be squashing the paper together too firmly. It’s hard to explain exactly how much water I squeeze out, so maybe I use less paper, and more water, than you do. The only way to know is to do another batch and see. Let us know if it helps! I think this is where the problems lies. I was squeezing out all the water out of toilet paper causing lumps. I made another batch but it was too watery, then another and if was better but I still had some lumps and I am not getting a smooth surface like you get. I think I have a lot of experimenting in my future!!! Thanks for the help. One other thing you might try is to get your hands into the mixture, after you’ve run your electric mixer to smooth the clay as much as you can. Since the ingredients aren’t really intended for art projects, you might want to wear latex gloves. Get in there and feel around for lumps, which can usually be broken up if you rub them between your fingers. Can you recommend a matte acrylic varnish for finishing paper mache? I use whatever brand is available in my local “art” store. It’s really a paint and glass store, but they have a small section for art supplies. I think the brand I use is Golden, but any national brand should work just fine. This has nothing to do with Lisa’s wonderful zebra – but I thought this might be a good spot for this interesting news article. According to this report, a paper mache alligator has been floating on a pond near Land Oâ€™ Lakes High School since 1987! If this is true (and there are photos to prove it) the students who graduated in 1987 know the secret to making paper mache waterproof. If anyone happens to know the Jennifer Fitzsimmons mentioned in the article, or anyone else involved in the gator’s creation, please ask them to tell you how they kept the critter “alive” for so many years. And then – please tell us, too! Great zebra!!! Congrats, Lisa. And what a funny piece of news about the inmates! I’m still laughing. That’s funny about the prisoners making paper mache fake bricks. That reminded me of the time I taught an art class in a juvenile hall on calligraphy one month. Then went back the next month and there on the fences and buildings were the most beautiful calligraphy graffiti. Had to laugh, they did learn the lesson on calligraphy alright. The piece really was worth those awards. It is a beautiful piece and the work that went into it. Congratulations.